Dr Arti Agrawal, a Senior Lecturer in the Department of Electrical Engineering, has been made a 2016 Optical Society (OSA) Ambassador. Senior Lecturer in the Department of Electrical Engineering, Dr Arti Agrawal, has been made a 2016 Optical Society (OSA) Ambassador. The Optical Society (OSA) is the world’s leading professional association for optics and photonics. It was founded in 1916 and is the leading organisation for global leaders in science, engineering and business who are interested in furthering the study of the science of light. Dr Agrawal is “delighted and honoured” to have been selected as one of OSA's ten inaugural 2016 Ambassadors - candidates were chosen for their distinction in efforts to serve the optics and photonics community through their education and research. In the OSA centennial year, the Ambassadors are expected to share their experiences and perspectives with students and young professionals in their field, providing career advice, technical knowledge and mentorship. Dr Agrawal’s research specialisation is the modelling of photonics components. She is an expert on Finite Element Method (FEM) and applied numerical methods to optimise performance of optical devices. Her PhD dissertation was about the development of wide angle beam propagation methods and she has taught on the BEng Electrical Engineering programme for several years, encompassing First Year Physics, Third Year Signal Processing, and Second Year Biomedical Optics. 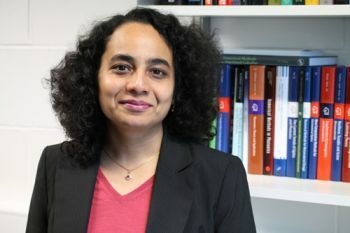 She was awarded the City Excellence Award for Teaching in 2014 and is a Chartered Engineer, Chartered Physicist, Senior Member of the IEEE and Senior Member of Optical Society of America (OSA). Arti is passionate about encouraging women and young girls to take up careers in STEM subjects as well as LGBT rights. Dr Agrawal and Professor B.M. Azizur Rahman are co-authors of the book, “Finite Element Modelling Methods for Photonics”. (Artech House, 2013). A Chartered Engineer is an Engineer registered with the Engineering Council (the British regulatory body for Engineers). Chartered Engineers are degree-qualified and have gained professional competencies through training and monitored professional practice experience. This is a peer reviewed process. The formation process of a Chartered Engineer generally consists of obtaining an accredited Master of Engineering (MEng) degree, or BEng plus MSc or City and Guilds Post Graduate Diploma in an engineering discipline, and a minimum of four years of professional post graduate experience.